Discussion in 'Femmes' started by papa_levante, Jun 15, 2009. We've already said it, written it or at least thought it loud: Joy Models has brought their new vision of the blonde look on the scene with models like Siri Tollerod, Toni Garrn or Erin Heatherton. And they don't seem to be ready to stop it now with another blonde who breaks the rules of blondness again, Karolina Karl. Found in by D-Max in Lithuania (another good address to find some non-standard blondes, think of Aida and Ieva - two in a million), Karolina (5'9) is making her first steps in Milan with some fresh pictures focusing on how playful (and classy) she looks in front of the camera. One we couldn't not follow. One we would follow. One we will follow for sure. Her hair is very very similar to Ruslana's, a rapunzel hair I'd say I need some polas ! And she needs to grow more her hair. Her poses like a hight model, body as well. you can see two polas in her mother agency. ^ I agree will all the comments so far and she doesn't look awkward in any of the photos unlike other models that are just starting out. She looks like quite a versatile model in these shots, I'm intrigued! don't know what's her mother agency, could you pls post them then? 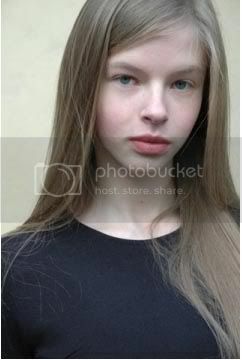 I checked Joy Models which I assumed was her mother agency, but I didn't see anymore photos than the ones we have. Can you get them for us, please? Where? From Lithuania, she started her career with D-Max there and quickly found some new homes abroad at Joy Models in Milan then Angels and she just loves being in Paris. When? Right now. We saw her in Paris ten days ago when we met her at the agency. What? She's working on her book, first in Milan then in Paris. Getting a whole bunch of high-quality tests from both cities. That's how she caught our eyes first. What's next? Nobody can tell but she's clearly one of the most photogenic girl we've ever met (despite her young age) and a girl that really wants to model. Complete package ? Good start at least and geniune personality as well.